The popularity of the modern sport of Stand Up Paddle Surfing (SUP) has its origins in the Hawaiian Islands. In the early 1960s it took its name (Beach Boy Surfing) from the Beach Boys of Waikiki who would stand on their long boards and paddle out with outrigger paddles to take pictures of tourists learning to surf. In the early 2000s Hawaiian surfers such as Dave Kalama, and Laird Hamilton started SUP as an alternative way to train when the surf was down. 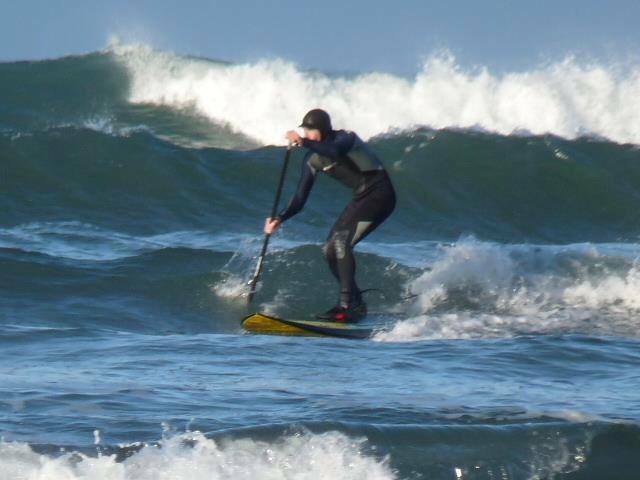 SUP is so versatile it can appeal to anyone whether you want to learn to surf small waves, progress to paddling the open ocean or prefer the idea of a flat water safari in a harbour, on a lake or down a river or canal. Whichever you choose Saltwater Safari will help you have a great time on your own or with family &/or friends whilst giving your muscles & core stability a great work out! Call Saltwater Safari and we will get you SUP-ing. We want you to have fun and succeed. We use stunning venues across Cornwall which we choose to ensure you get the right tide and weather conditions. Some of our venues include Camel Estuary, Bude, Siblyback Lake, Port Quinn, Daymer Bay. You will paddle on a stable soft-top paddleboard exploring the sea and coastline from a totally different & awesome viewpoint. We hope to inspire you with our own enthusiasm for the natural world and take pride in our knowledge of and respect for the wildlife we encounter on a SUP Safari. 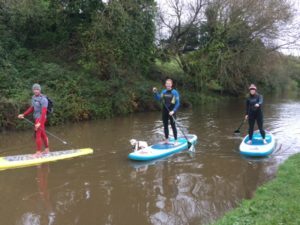 SUP Introductory Session: half day – 1-to-1 or with friends – this will get you standing up & paddling in a stunning environment. We will coach you in the techniques you need to paddle, turn, self rescue and fall off safely – all part of the fun! 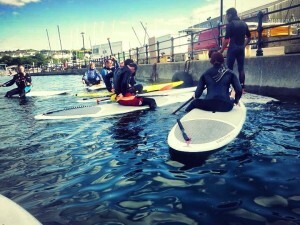 Family Fun session: half a day – experience SUP-ing together. Sessions will vary depending on the age and number of children in your family. Advice: Want to buy your own board ? Saltwater Safari can advise you on the best board and paddle to suit your style of SUP-ing.